Rune Focus: Duration: [14 / 15 / 16 / 17] seconds. Channeled Focus: Duration: [17 / 18 / 19 / 20] seconds. Restoring Focus: Cost: 920 Stamina, Duration: [17 / 18 / 19 / 20] seconds. Rune Focus creates a rune which increases your armor and spell resistance while standing inside. The Channeled Focus morph reduces the casting cost, and also restores your Magicka, while Restoring Focus increases your healing received and provides additional damage reduction. All of these effects only benefit the caster, and not their allies. Channeled Focus is a recommended morph for the Templar Initiate, Gleaming Champion and Beacon of Hope builds. Rune Focus now applies the Major Resolve and Major Ward buffs for 12 seconds, and the buff will persist for 8 seconds after you leave the protected area. Channeled Focus: Reduced the cost of this ability by approximately 40%. Restoring Focus: This ability now provides the Minor Vitality buff while inside the rune. Revised the tooltips for this ability and its morphs to indicate that all the effects provided by this ability and its morphs will now remain on you for up to 8 seconds after leaving the rune's radius. Restoring Focus: This morph now grants you the Minor Protection buff, in addition to granting the Minor Vitality buff as a morph effect. 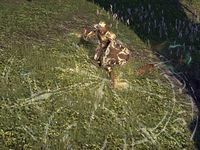 Developer Comments: The new design of Rune Focus more closely matches the fast action combat, while still preserving the original feel of an area of protection. Reduced the cost to match the Channeled Focus morph. Restoring Focus: This morph now costs Stamina and grants Stamina to you every second, and no longer gives Minor Vitality and Minor Protection. Developer Comment: Minor Protection was moved to the Spear Wall passive to retain the total damage mitigation for tanky Templar playstyles.